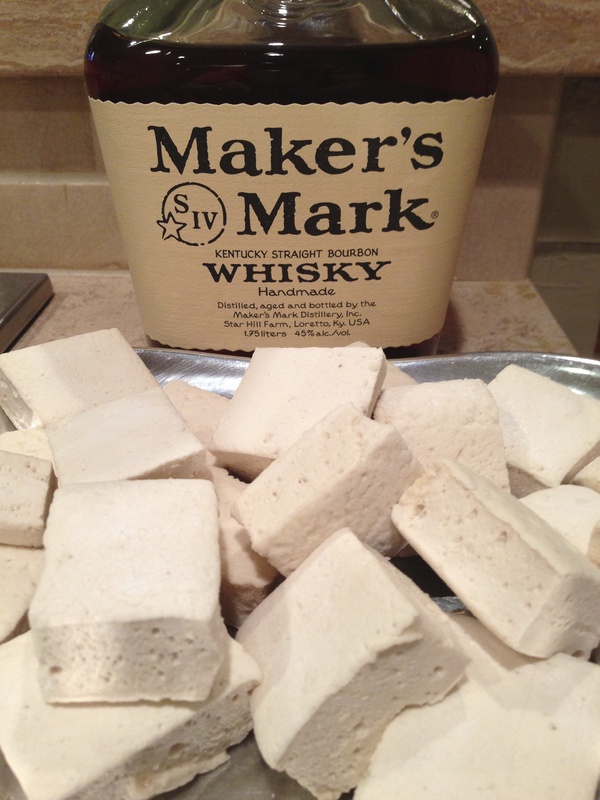 maker’s mark marshmallows | Is there any wine left? 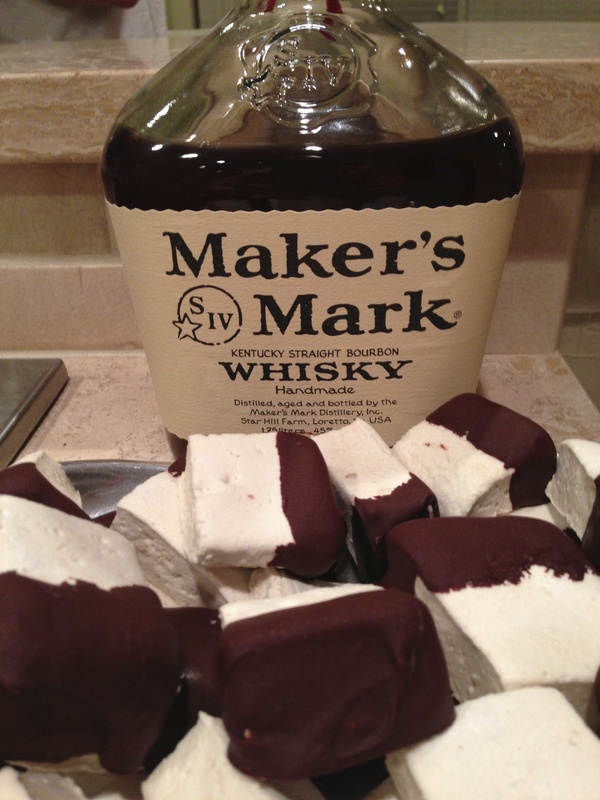 Whitney sent me this link the other day for bourbon marshmallows with a comment about how good they looked. For some reason, the thought of paying for the marshmallows didn’t bother me, but paying shipping for something I could easily make at home did. This is what Amazon Prime has done to me, people. I can no longer pay shipping for anything. So, I started looking up recipes and testing. Almost every single recipe called for high fructose corn syrup, which bummed me out because I never use it (in fact, I didn’t even have a bottle in my pantry and had to go buy some). But corn syrup is to natural sweeteners what safflower oil is to olive oil — it has a higher smoke point and doesn’t break down at high heats. 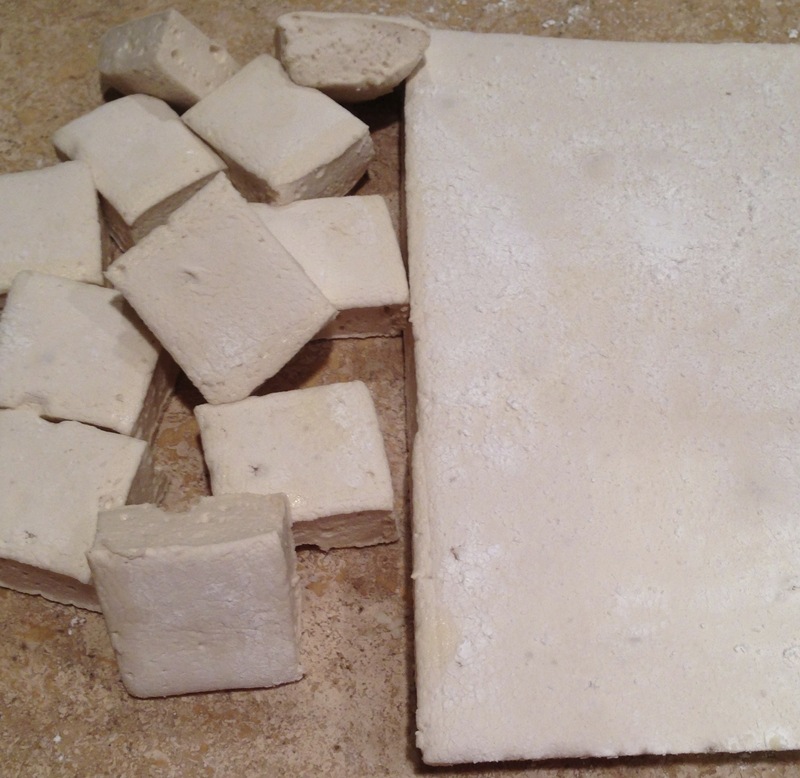 Using just honey, maple syrup and agave nectar would cause crystallization in the marshmallows. But don’t scrap the natural sweeteners altogether. These turned out perfectly when I used 1/2 agave nectar and 1/2 corn syrup. Anyway, these are like fluffy, perfect little pillows of heaven that smell like LSU Game Day (’cause of the Maker’s). Once you’ve had these, I really don’t think you’ll be able to go back to the bags of Kraft Jet-Puffed Marshmallows again. Use them in s’mores, in hot chocolate, or my favorite — just plain snacking. And if you don’t want to use Maker’s Mark, or are just looking for another variation, try adding brewed coffee, red wine, or Kahlua in place of the whisky. Or use water in place of the whisky and add a few drops of lemon juice and zest, or butterscotch extract, or peppermint extract when its all in the mixer. You could also swirl in melted caramel or melted chocolate once the marshmallow batter has been poured into the pan. Seriously. Get creative and the possibilities are endless. 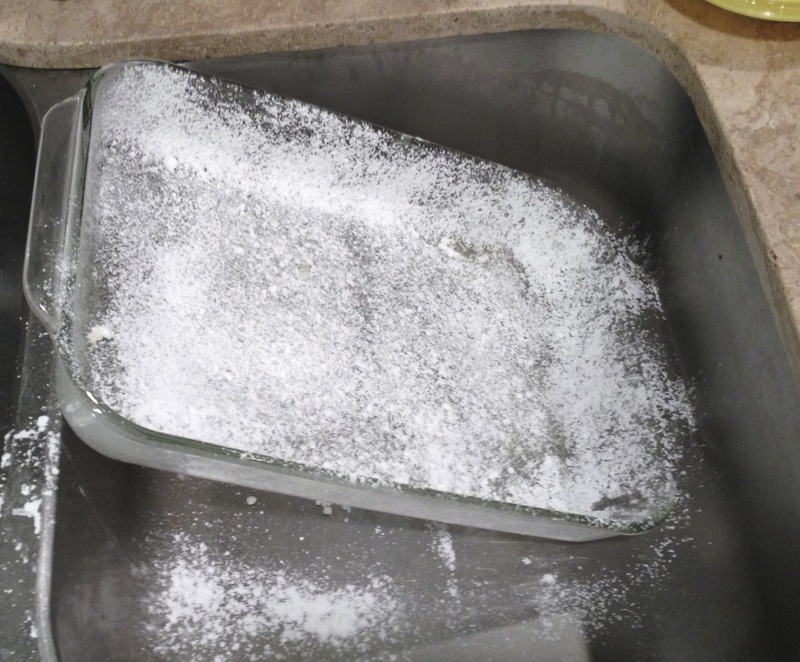 Spray a 9 x 13 baking pan with Pam and dust it with powdered sugar until it is coated. Do this in your sink. It will be a hot mess no matter how careful you are. Set it aside. In the bowl of a mixer, stir 1/2 cup cold water and 3 1/2 packs of gelatin together until it is just combined. Let it sit. 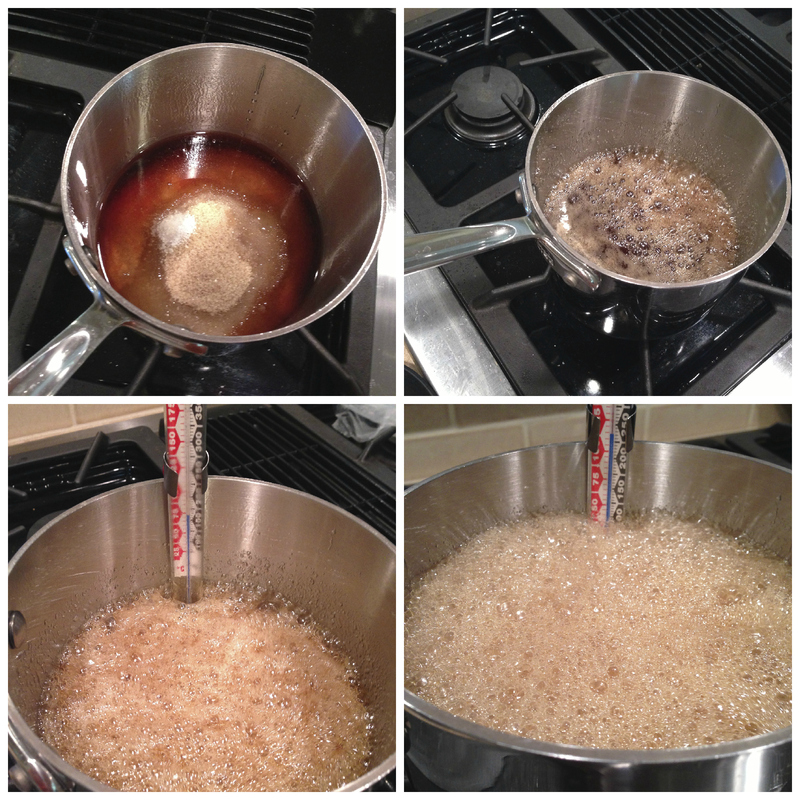 In a medium pot over low heat, combine the sugar, bourbon, corn syrup, agave nectar, and salt. 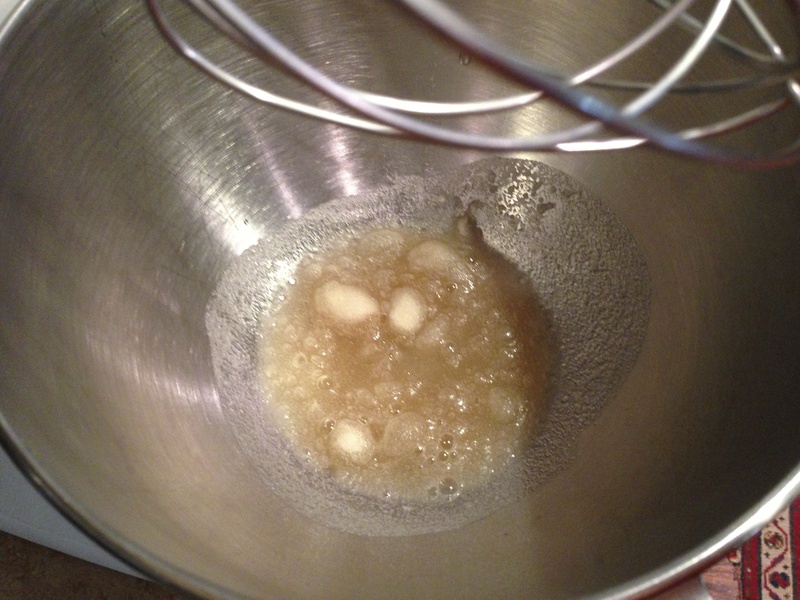 Whisk until the sugar is dissolved, about 3-5 minutes, then turn the heat up to medium and bring the mixture up to a boil. Let it boil for 8-12 minutes, whisking every minute or do, and watch it carefully as it could easily bubble over. Clip a candy thermometer to the side of the pot and keep your eye on it — your end goal is 240 degrees F.
You’ll need beaten egg whites in the middle of the next step, so go ahead and beat them now until stiff peaks have formed and set them aside. Once the sugar mixture reaches 240 degrees F, remove it from the heat and pour it in the mixer over the gelatin with the mixer on low speed. Crank up the speed to high, and it will turn from dark brown to a creamy white color over 6-8 minutes. When it is white and fluffy, add the beaten egg whites and vanilla to the sugar/gelatin mixture and beat again until just combined. Pour the marshmallow batter into the coated 9″ x 13″ pan. If it does not all come out, which it probably won’t, spray a spatula with Pam and scrape the rest out. Then spray that spatula again and use it to smooth out the top. Sprinkle* powdered sugar on them and set them aside for 3-5 hours to become firm. *Using a fine mesh strainer helps get the clumps out of the powdered sugar and creates a smoother layer of coating. You can test their firmness by slightly pressing on the marshmallow to see if it bounces back. When they are ready, flip the pan over onto a cutting board and cut them into uniform sizes. If you want to take them one step further, dark chocolate is the perfect compliment for the whisky. Melt a bag of good-quality dark chocolate chips in the microwave by heating for 20 second intervals and stirring well each time. It shouldn’t take more than a minute total. Drag each marshmallow through the chocolate then lay them on wax paper on a cookie sheet to firm up. You can stick them in the freezer to speed up this process if you’d like, but they won’t be as pretty. Now…. what to do with them? S’mores? Hot chocolate? Snack? 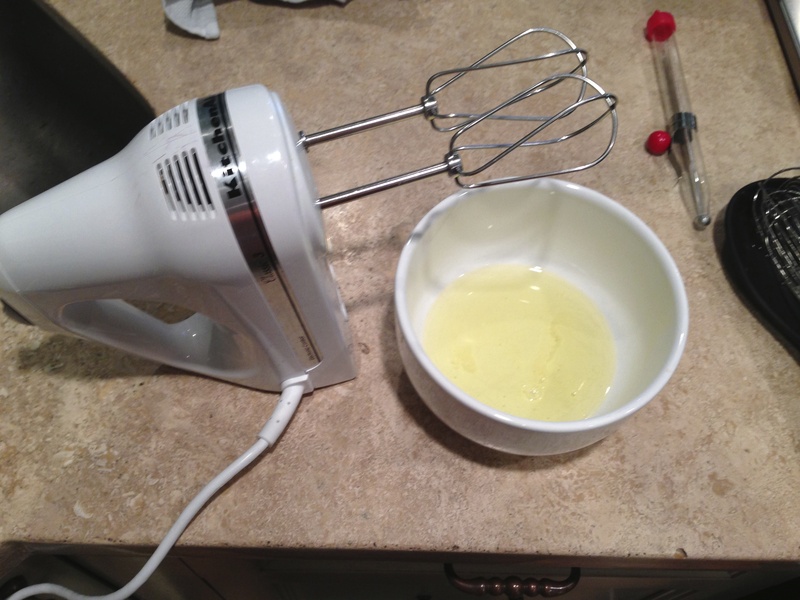 Beat two egg whites until stiff peaks have formed and set them aside. Once the sugar mixture reaches 240 degrees F, remove it from the heat and pour it in the mixer over the gelatin with the mixer on low speed. Turn the speed up to high, and it will turn from dark brown to a creamy white color over 6-8 minutes. When it is white and fluffy, add the beaten egg whites and vanilla to the sugar/gelatin mixture and beat again until just combined. 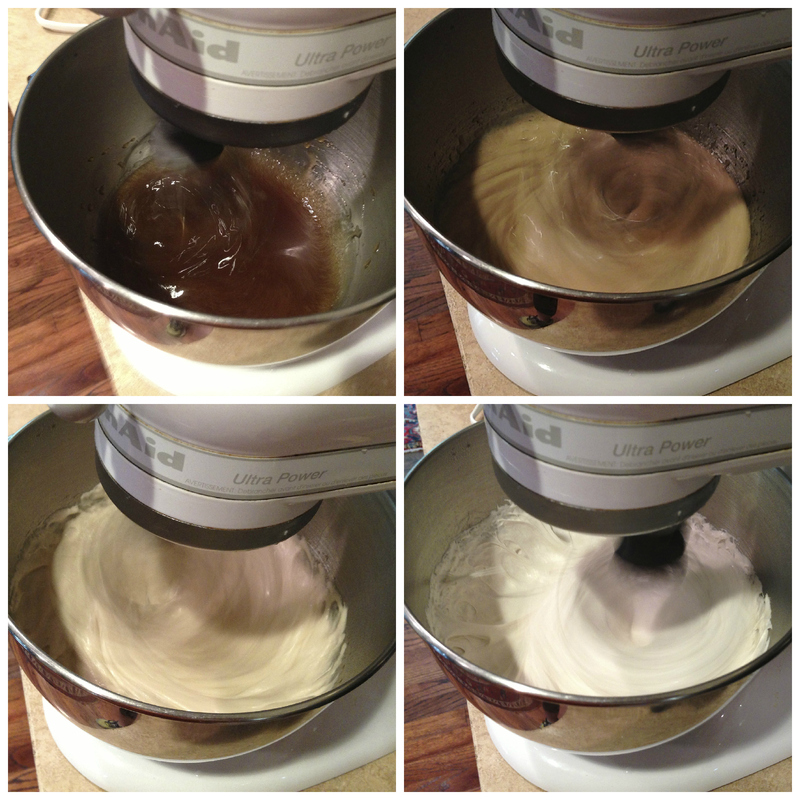 Pour the marshmallow batter into the coated 9″ x 13″ pan. If it does not all come out, which it probably won’t, spray a spatula with Pam and scrape the rest out. Then spray that spatula again and use it to smooth out the top. Sprinkle powdered sugar on them and set them aside for 3-5 hours to become firm. When they are ready, flip the pan over onto a cutting board and cut them into uniform sizes. Melt a bag of good-quality dark chocolate chips in the microwave by heating for 20 second intervals and stirring well each time. 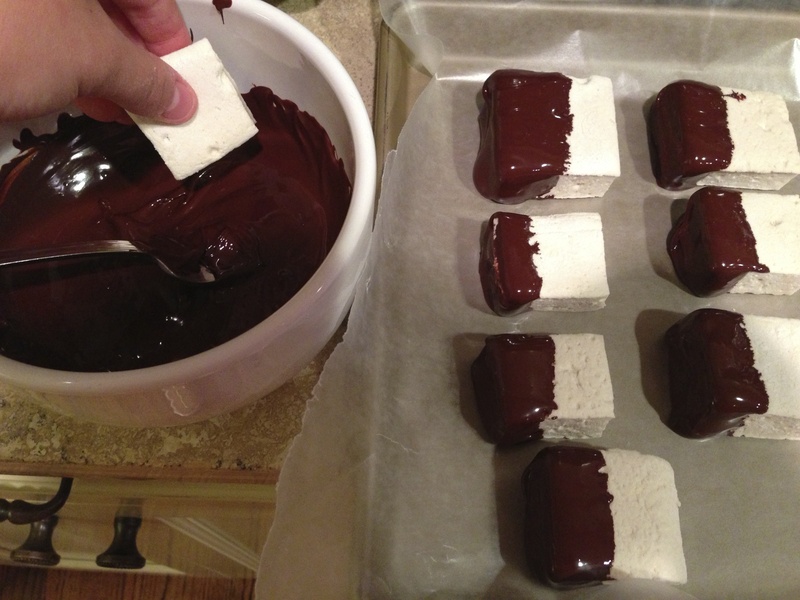 Drag each marshmallow through the chocolate then lay them on wax paper on a cookie sheet to firm up. The marshmallows can be kept in an airtight container for 5-6 days. hostess gifts: homemade | Is there any wine left?